Have a Healthy Helping of History This February’s Black History Month, Via the Picture Book! Ever hear that plaintive cry by a child during a board game or a kid-organized activity involving rules and teams? The cry is both insistent and outraged. The cry is “NO FAIR”! Kids have an inner barometer and compass for fairness and they call YOU on it and each other at the first hint of deviation from this innate fairness doctrine. 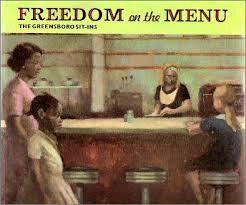 Ms. Weatherford has expertly captured the tension of eight-year old Connie’s perception of the absence of fairness heralding the struggle for equal rights for blacks in the unfolding of what came to be known as The Greensboro Sit-ins. On a February day in 1960 in Greensboro, North Carolina, four young black men dared sit at a Woolworth’s lunch counter reserved for whites and asked to be served. Of course they were met with resistance, but were quickly joined by other young people in this peaceful protest for equal justice. It became the catalyst for a wider movement of quiet defiance against an “unfairness” that extended to use of water fountains, swimming pools, movie theaters and bathrooms. Connie’s simple desire to sit at the counter with her Mama and enjoy a banana split and her Mama’s reply of “Not here, Connie.” “I’ll fix you one at home” is a young girl’s first introduction to discrimination as she grumbles, “Won’t be the same”. Nope, it sure won’t. For as young Connie watches her brother and sister register to vote, making signs that say “Equality Now” she is both excited and afraid. Quick to realize that something larger than a banana split is at stake, she quietly absorbs the reality that for change to occur, risk is involved for those she loves. It’s hard for our children to imagine perhaps this type of pervasive discrimination so encultured into a society 50 years ago, separated as we are in time and place from those events. But this picture book, with its child’s viewpoint of the unfolding events at Greensboro gives it a greater resonance with kids, I hope. It is a book worth reading with a history of struggle wonderfully illustrated, told and very relatable to a child, with an emphasis on the simple things that can impact the quality of a child’s life. Want a great field trip with the kids? If you’re in Washington, D.C., both you and your children may want to drop in at The Smithsonian and see there a section of the ACTUAL Woolworth lunch counter where the young black students sat in 1960. Read the history here in Ms. Weatherford’s retelling and then touch a piece of an important part of the history of our nation this February during Black History Month. It’s a great addition for a school library, classroom collection or better still, please read to your children this “once upon a time” story with a “fair” AND happy ending.